Where does your food come from? If your answer is “the grocery store,” you may need to be asking more questions. Vegetables lose up to 50% of their nutrients during the trip to the grocery store, so by the time you purchase your week’s worth of produce from your local Publix, Kroger or Trader Joe’s it’s more than a week old (yummy). Serenbe Farms has offered shares of their certified-organic veggies, herbs and plants for more than 10 years. Members of their CSA (Community-Supported Agriculture program) receive an abundance of food, recipes and tips on how to use their share and the knowledge of where their food is grown and who is doing the growing. Are you hooked? Here are 5 ways you can CSA with Serenbe Farms. 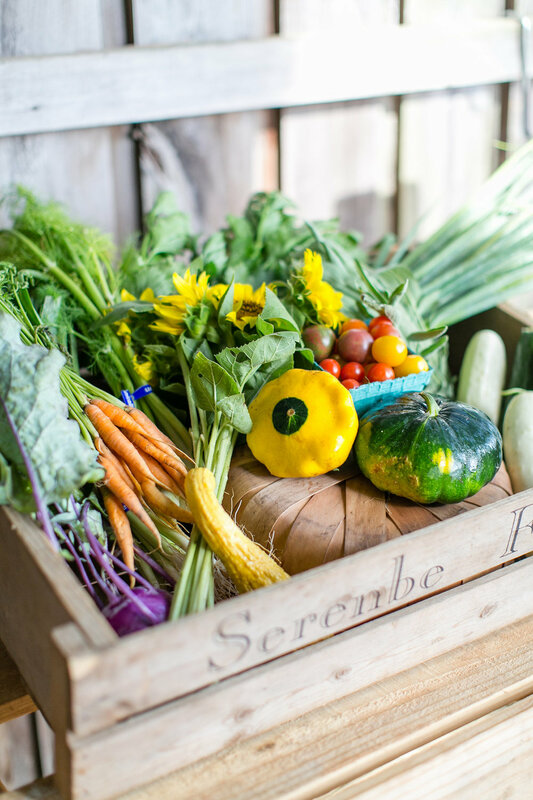 Choose 3 CSA items each of the 30 weeks of Serenbe Farms’ bounty. The partial share is perfect for out-of-towners or members who can only get to the Farm 10 weeks out of the season. You’ll still get the full 9-12 items each week you come down, but you won’t be locked-in to the full 30 weeks. Not to be confused with the part-time share, the Partial Share allows you to pick up 6-7 items each of the 30 weeks of the Serenbe Farms CSA. This share is great if you’re cooking for 1-3! Cooking for 4+ people? Love eating lots of veggies? Don’t want to miss out on the wide variety of what Serenbe Farms has to offer? This share was crafted for you. Pick up 9-12 items each week for the full 30 weeks of the Serenbe Farms CSA. You also have the option to upgrade to a Full Veggie Share Plus, which gives you free entry to the Fall Farm Party and to farm tours. Serenbe residents are also eligible for the added benefit of Share Delivery. Skip your trips to the grocery store when you add on White Oak Pastures meats and eggs to your farm share. Serenbe Farms CSA is the only Farm CSA that offers White Oak Pasture’s certified, non-GMO meat cuts and pasture-laid eggs. Choose from 2-3 different meats each week, ranging from chicken and beef to lamb and pork. Visit serenbefarms.com/csa to learn more about why your health AND wallet can benefit from a CSA Program, and to sign up for the Serenbe Farms CSA.